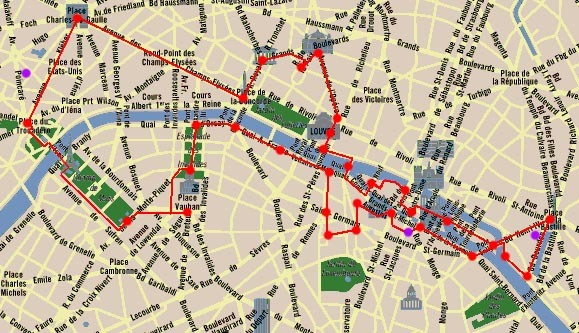 This is a route intended for those who want to discover Paris by roller skate. It shows you many nice places over a reasonable distance. This web page may take a while to display in full due to the number of pictures, albeit small ones, contained (some pictures are visible in high resolution in the page Photos of Paris on this site). Don't be disappointed if some pictures are missing: you will see your best souvenirs with your own eyes. Trocadéro: "Vertical Line" shop, 60 avenue Raymond Poincaré. Bastille: "Nomade" shop, beginning of Bd Morland. Notre-Dame: "Bike'n roller" shop, rue St-Julien-le-pauvre (roller lesson available). Duration: it depends upond your roller skating level and if you like to stroll. Finishing in less than three hours is difficult, even if you are used to rollers and in good health. I think a good afternoon is more realistic (for example from 2 pm to 7 pm). But you can also spend the whole day (looking at the town, eat a sorbet, sunbathing on the Seine quay while looking at the "Bateaux-mouche", studying Notre-Dame architecture). If you can, start late morning to have enough time. Copyright: all the elements of this page have been created by Godefroy Troude (except the map of Paris). Reproduction not allowed, even partial, without hand-written permission of the author. You can rent roller skates close to the place, at "Vertical Line" shop, 60 avenue Raymond Poincaré. Note the colouring of the pavement which draws a big star on the ground of the place (hence its name). Going down the Champs-Elysées by roller is a real pleasure: a slight slope and smooth ground. Take the south sidewalk (the right one when going down from the Arc de Triomphe) because the north sidewalk is narrowed by a tunnel at the begining. Telephone boxes are attractive but you will have to be slim to fit inside. Perhaps will you pass some futuristic vehicles from the Mairie de Paris (town council of Paris): the Champs-Elysées seems to be their meeting point. On the pictures, three different models, among them a vertical one - my favourite one - front and back behind the two nice lady roadsweepers. Perhaps will you see some desperado going down inside the car park / service-station (picture) passing under the Rue Georges V (I advise you not to follow them unless you can stop from 30 to 0 KM/h in less than 3 meters). Try to cross the street before arriving at Place de la Concorde because the south sidewalk ends by a slightly dangerous express way. On Place de la Concorde, the Obelisk brought back from Louxor by Napoléon (gift from the Egyptian King), recently restored. Early this century a sundial project used the Obelisk: at the base, on the north side, note the hour line in the pavement. Take a look at the particularly ornate candelabra. Eglise de la Madeleine. Nice old style "Maille" shop. Fauchon, a luxurious delicatessen, behind the Eglise de la Madeleine church. Don't mistake avenue des Capucines with rue des Capucines, otherwise you will miss place Vendôme. The Vendôme column, in the center of the place. I like the aluminium urban look of the place, with the milestones which avoid creating a sidewalk. The Ritz hotel. Opéra de Paris. I advise you have a close look and turn around. Nice statues and candelabra. At the end of avenue de l'Opéra, the Comédie Française, national theater. Just behind, the Palais Royal with the columns of Buren. Palais du Louvre, Pyramide du Louvre. The Cour carrée is wonderful at night (picture). Be discreet, rollers are not always allowed. Above the quay, as well as nice parisiennes, you can see the Seine river below, and nice parisiens :-). It's not really possible to skate on the quays because of the cobbled ground. From passerelle des arts bridge, nice view on île de la Cité and Pont-neuf. Musicians are very often here. Conciergerie, the Law court. On the left, on the right bank of the Seine river, Châtelet place (picture) and far off the town hall. Flower market. You can even find carnivorous plants ! On the right, far off, the Sainte Chapelle. Police headquarters. In front of Notre-Dame is the "zero kilometer" from where all distances from Paris are calculated. If you skate on the cobbled ground in the middle of the place du Parvis, you will see the marks of the old street house. Nice view of the side and the back of Notre-Dame church. As on the pont des Arts, everyone is having a good time on the Pont St Louis. On the island, you'll find many delicious ice-cream makers. Colonne de Juillet. 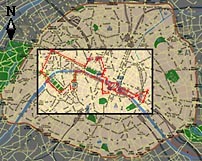 Look at the location of the Bastille fortress, marked on the ground at the beggining of rue St Antoine by a cobbled line. You can rent some rollers at the "Nomade" shop in the first few meters of the Boulevard Bourdon. Marina of Paris. Nice view of the Ile St Louis. Nice view of the Ile de la Cité (from the Seine quay down below). The next hundred meters, the best view of Notre Dame. Just opposite the tree, you can rent rollers at the "Bike'n roller" shop. They give lessons too. Very lively area. Cinemas, restaurants. I love rue St André des Arts, tight and tortuous. Crossroad with rue de l'ancienne Comédie, a space invader is watching you... Beware, there is more and more in the area ! Again a racing car of the Paris cleaning service ! Eglise St Germain des prés. The cobbled circle in front of the church is not nice. Cross the place by going by the "Aux deux magots" café. You will cross the medical school and Beaux-Arts school. The Musée d'Orsay, old railway station "Paris Orsay" (you can read the letters "PO" on the picture of the front). In front of the main entrance of the museum, the Grande Chancellerie de la Légion d'Honneur with its wonderful garden. Do a detour by the pont Alexandre III (I don't like it since it has lost its old green sheen) to look in the right bank at the Grand Palais and Petit Palais. Hôtel des Invalides, wide lawn. Nice view of the back of Hôtel des Invalides. Straight streets, wide and very quiet. The "motocrotte" (Moto-poop), the missing element of the Paris cleaning service collection ! Whow, I've got them all ! Under Eiffel tower, impressive view. Beware of falling ! At each end of the pont d'Iéna there's some strange soft plastic strips which stop roller wheels.... Fountains and Trocadéro gardens. Big slope ! Click on the left icon to download a page to print, containing a list of the streets to follow (PDF format, 110 KB). It's a resume of the upper array "Route details". I want to thank Bruno Dassas, to lodge this Web page and to lend me his Casio digital camera. I thank also "beta-testers" Bruno Dassas, Christophe Andréani and Marc Ferrari, who checked with me the reality of the course I imagined. If you liked this course, send me a small mail and create a course in your own town.